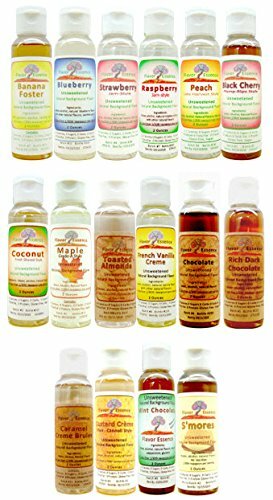 Unsweetened Natural Background Flavors by Flavor Essence -Hampton, NH -small-batch bottlings for creative gourmet and health-conscious people. Ideal for flavoring waters, coffees, teas, kombucha, yogurt, cakes, cookies, frostings and creative bar drinks. These are natural flavor concentrates out of New Hampshire. They are "gourmet-quality" because they are concentrated at levels that creative foodies can easily control background flavors in single-serving beverages, as well as add very fun supportive flavoring in batters and doughs. *** In Food Recipes *** great in muffin mixes, cake batters and frostings, bread doughs, mousses, yogurt, pancake batters, French Toast washes/batters (or to flavor the maple syrup itself). WHAT THESE ARE FOR: These are "background" flavors that are natural and unsweetened; intended for creative foodees and health-conscious folks; add clean gourmet-quality undertones to your favorite beverages, baking projects, dressings, sauces; create your own blends too. (FYI for 1st-timers: These are not syrups and do not have the "pow" of a syrup). BASIC NUTRITIONAL INFO: 0 Sugar, 0 Sodium, 0 Fat, 0 Carbohydrates, 0 Cholesterol, Gluten free, Vegan-based (Contains: no sweeteners, no color added, water, alcohol, natural flavors only) --alcohol per serving is purposely minimized to less than 1/30th of a teaspoon, then diluted by your beverage and food serving. PACKAGING & USAGE AMOUNTS: You get Five 2 Ounce Bottles; with a flip-top measuring cap. Serving Size for large Beverages: a couple drops up to a generous squeeze; 30+ servings per bottle. Serving Size for Baking projects, dressings, sauces, etc. : 1 teaspoon for approximately 12 Batches. If you have any questions about this product by Flavor Essence, contact us by completing and submitting the form below. If you are looking for a specif part number, please include it with your message.